"Con L'Amore Non Si Scherza"
"Non Si Pensa Mai A Tutto"
Money for love against revenge! Antonio for Bassanio, Portia for Bassanio, Portia against Shylock: can the Jew demand a pound of meat from The Merchant of Venice? A noble Palace, its history and its rooms to get to the process! Palazzo Marin, a cozy Venetian Palazzo of the sixteenth century between Santa Maria del Giglio e il Gran Teatro La Fenice. Beauty overwhelmed by love, love overwhelmed by jealousy. Othello, Desdemona, Iago: passion, love, hate. 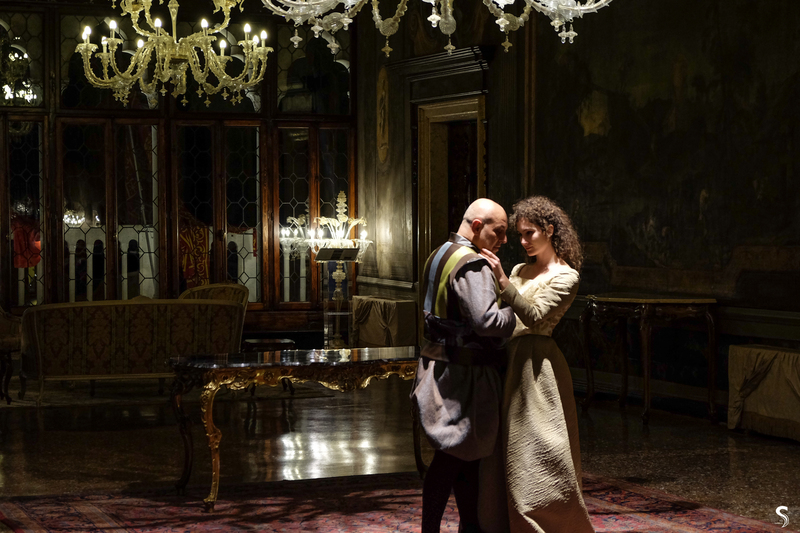 A traveling show where each scene is set in a different hall of one of the most fascinating Venetian Palaces. "Wives" the world premiere, was written recently and offers a contrasting view of American women. Instead of being victimized by an opportunistic man, they are firmly in control. "Wives" displays a definite power shift in the battle of the sexes. Carlotta Brentan plays the man's divorced wife, Giulia Bisinella plays his new fiancee.